First things first, I apologize for my absence on social media. My life has been turned upside down, and with work, moving, and everything else, I just haven’t been in a creative space. Everyday, I am getting stronger and feeling more inspired, but right now I need to take time for myself to heal. 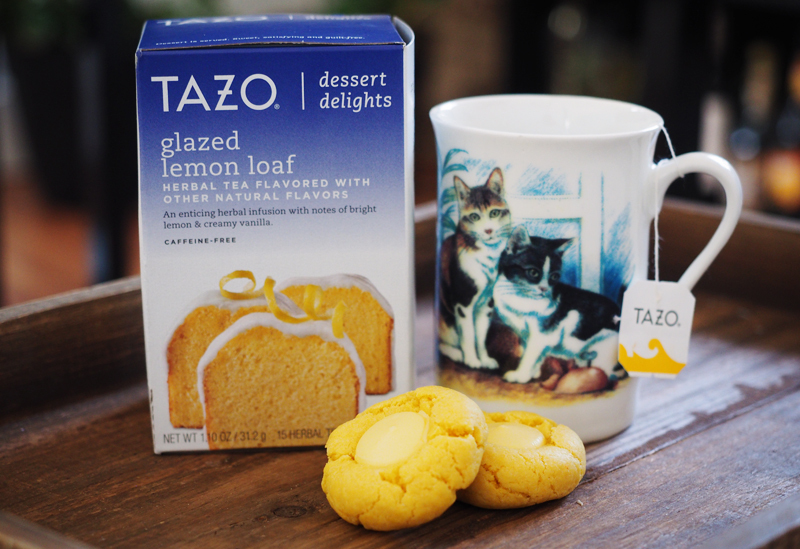 When life hands you lemon loaf, dig in…. 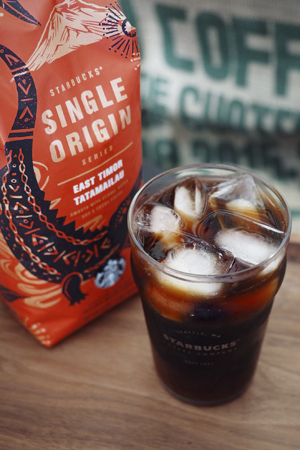 The latest single origin release comes from East Timor. East Timor Tatamailau. 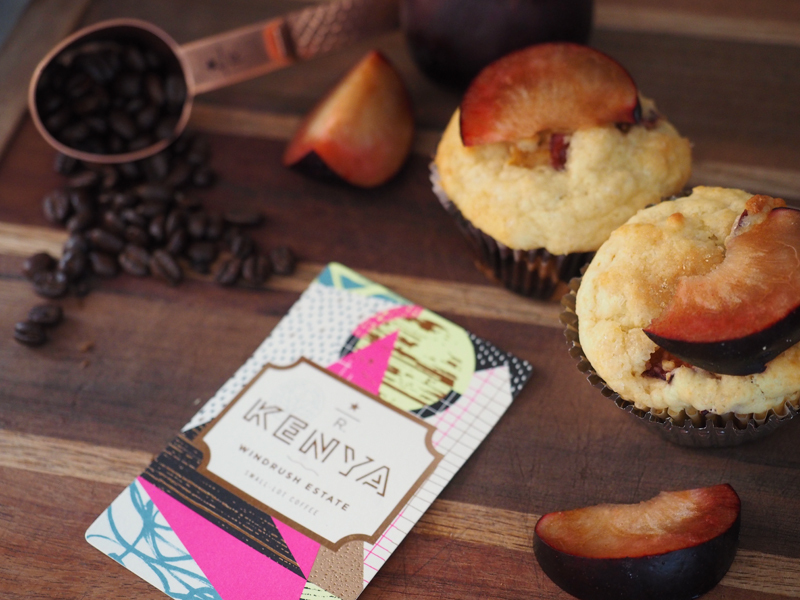 This washed dark roast has herbal notes with a cocoa finish. 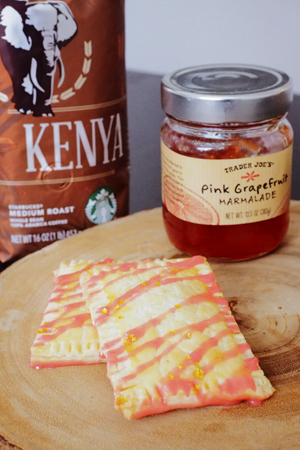 Since summer is still in full swing here, I really wanted to turn this into an iced coffee. Pulling from the complimentary flavors of maple, I decided to change up the four fundamentals and use maple water in place of regular filtered water. 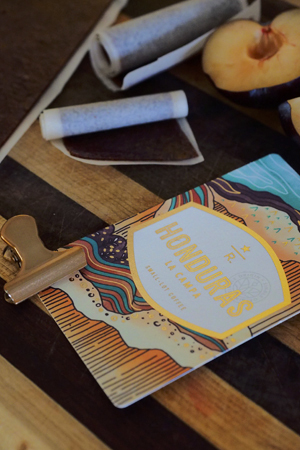 August’s reserve subscription is Honduras La Campa. This is only the second time that I have seen a coffee from Honduras, the first being Honduras Premier. The terrain in Honduras is rugged and precipitous, so getting ripe cherries has been a challenge. I am extremely delighted by this cup, unexpectedly fruity and complex with notes of plum and caramel. This is the second to last reserve subscription coffee that will be available, as the online store is closing in October. 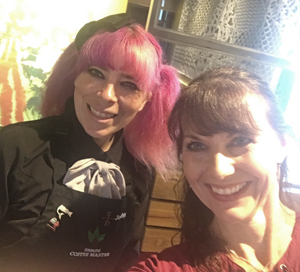 I will miss my exclusive coffee every month, but I know Starbucks will come up with something new and exciting to continue to delight us and expand our coffee journey. 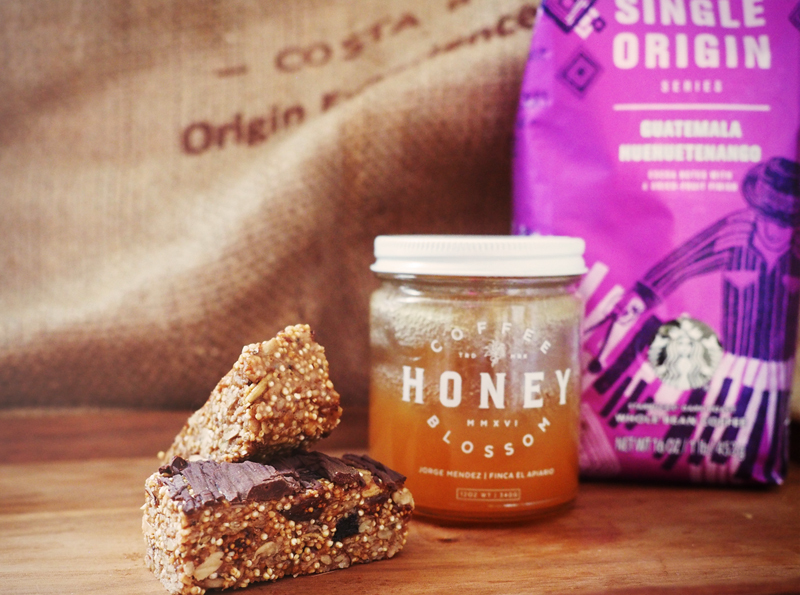 The final coffee will be Colombia la Casiana, which you can still get (until September 3rd) here…. 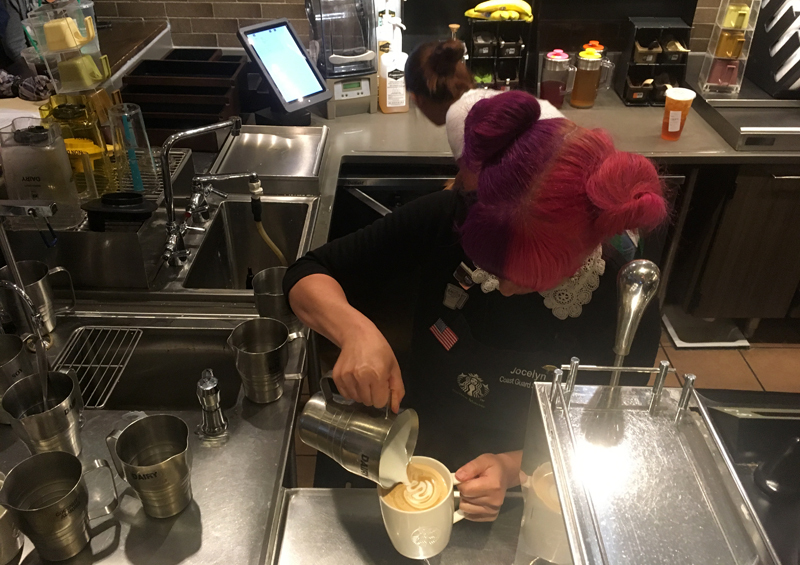 On August 15th we held our area barista championship finals. I was fortunate to be representing my district (#438). This is the second time I have completed in the barista championships, and the second time I have made it to area, so I was nervous, excited, but confident that I could do this. The format has changed since the last time I completed in 2015. 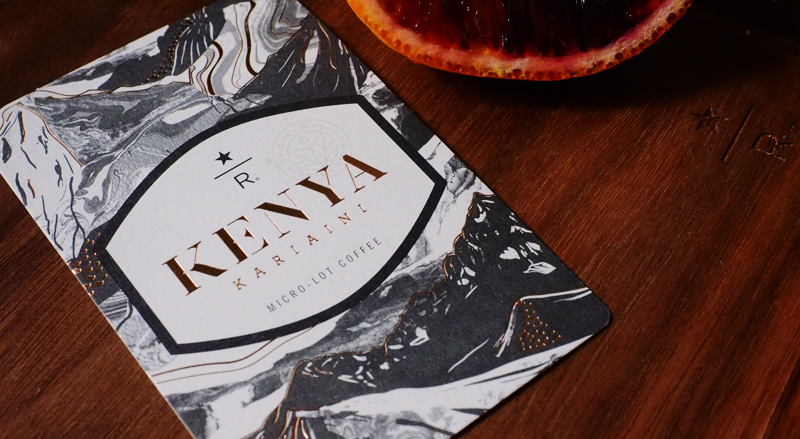 The coffee tasting element is no longer, and the competition just focused on barista craft and story telling. This time around we had to make a grande latte, tall flat white, tall caramel macchiato and an iced grande cinnamon almond milk macchiato. 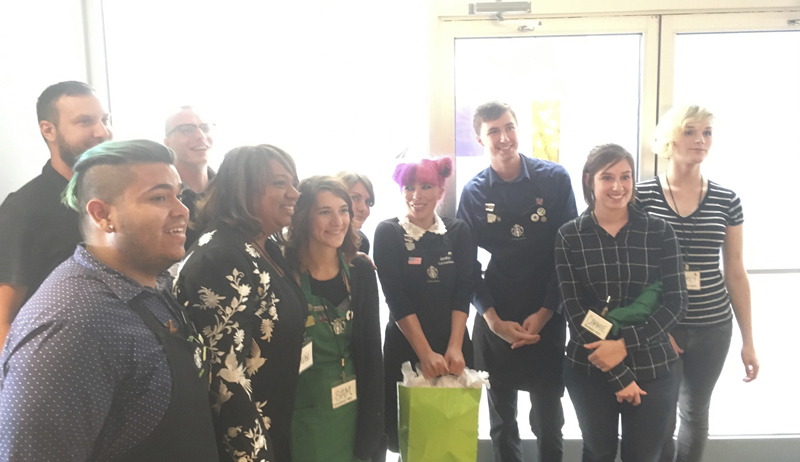 After the craft round, there was one other beverage, the customer favorite; an opportunity to weave what we do every day at Starbucks and share it with the judges. For months I knew my customer story. Obviously I would talkabout my husband, how we met at Starbucks, how I took him fro a vent dark roast, to flat whites, and now to americanos. How he is part of my coffee journey now. My district manager suggested I choose a different story, one that is about an actual customer, and not about my husband. Oddly enough, I had a very moving situation at work happen at around the same time. I am currently in a drive thru store, and I am always DTO (If you don’t work for Starbucks, that means I talk to you at the speaker box) It is my favorite role, and I just really love talking to people. I almost only strictly open, so I have gotten to know most of our morning regulars. One of my customers, who admittedly, I was not aware of her name (the curse of the DT. Partners, ask your customers their names at the speaker!) gets a tall almond milk mocha without whip cream. Our transactions have always been pleasant, and to be honest, there wasn’t anything that stood out in my mind about her. One day, I was doing some paperwork up front, and I saw her walk in. She asked how I was doing, and I told her.. “living the dream”. Her face lit up, and she proceeded to tell me that today was a very special day, and she wanted to celebrate with me. Confused, I asked her what we were celebrating, because certainly, I didn’t feel that our interactions have been celebration worthy. She opened up and told me that she had troubles with her hearing, and that’s why she goes through the drive thru, that coming inside is too loud, and she doesn’t feel comfortable. In the drive thru, she can just say her order and come on up. She told me that I am the only person that she can actually hear in the drive thru (if you work with me, you know how loud I am), that I speak loud and clear, but above all, I make her happy. She continued with sometimes if she is having a bad day, she’ll come in just to hear my voice and get perked up. That day was a celebration, because she was just fitted for hearing aides, and for the first time in a long time, she could hear, didn’t feel self conscious about her disability. She wanted to come inside, tell me her story, and take a picture with me. It was difficult to not break down and cry, but it really reminded me that this is what I do every single day, and even if we don’t think we are, we are making a difference in peoples lives. 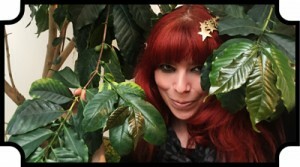 This was the story I shared at the barista championships. 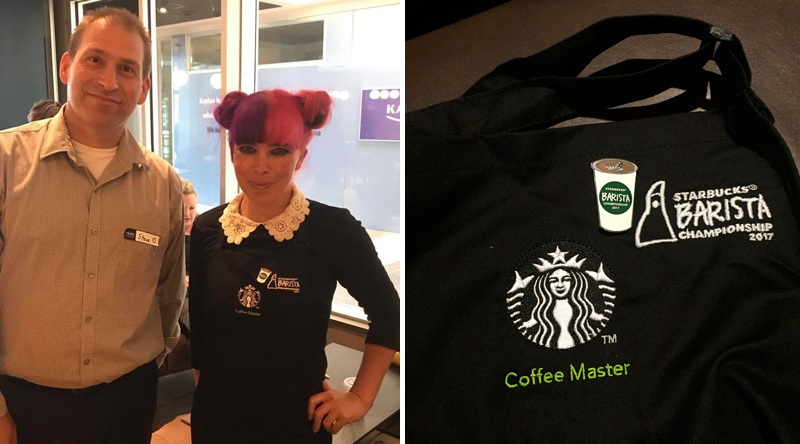 A partner came up to me and told me that my story made her cry… I knew that no matter the outcome, I was a barista champion. 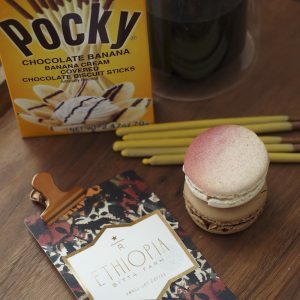 One of my friends was throwing a surprise party for her store manager, and she asked me if I could make a coffee mocktail to serve at the party. Doing stuff like this is right up my alley! Originally I had planned on doing the mint julep, but I had a few bags of the sun-dried Ethiopia Yirgacheffe Chelelektu, and I really wanted to do a play on an old fashioned. 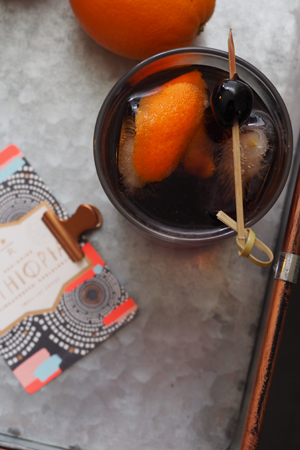 Combining cold brewed Sun Dried Ethiopia Yirgacheffe Chelelektu, cherry bitters and an orange peel syrup, topped with a luxardo cherry. Introducing the Cold Fashioned.